As we all know I’m a fan of colour & pattern and there’s no better way to make a statement in your home than with a colourful feature wall! Next on our decorating list is the master bedroom so I’ve been thinking of ways to incorporate a bit of colour onto the main wall. I have spent a good few hours perusing wallpaper murals from Wallsauce.com and I still can’t decide on a favourite. I think I need a bigger house so that I can decorate every room with a different one! 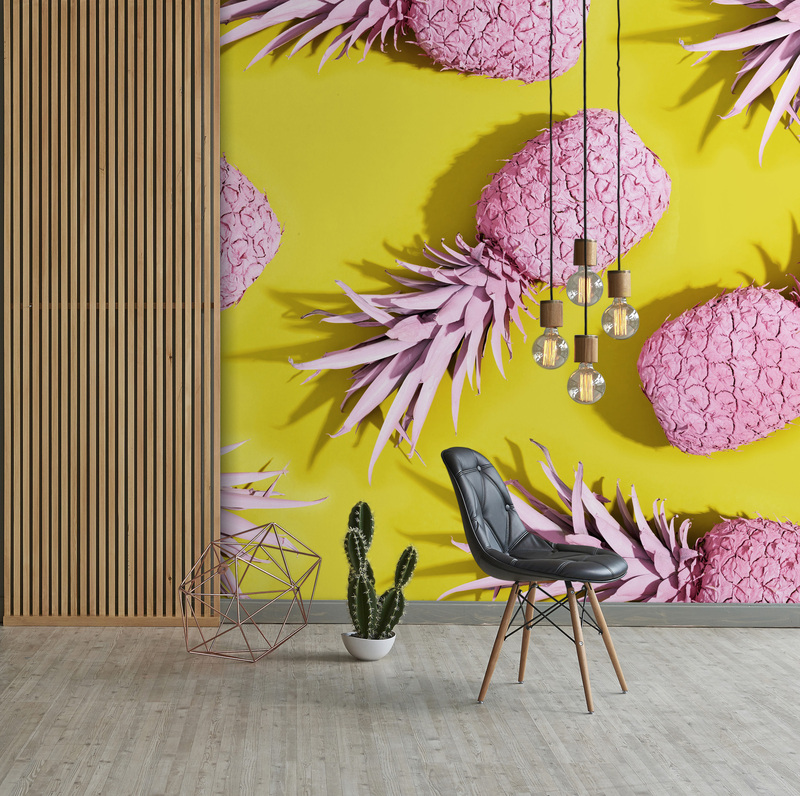 Wallpaper murals are a quick and easy way of creating a colourful, quirky design in your home and with hundreds of options available you’re bound to find a style to suit you. Wallsauce can even put together a mural of your own photo if you wish…how cool is that?! 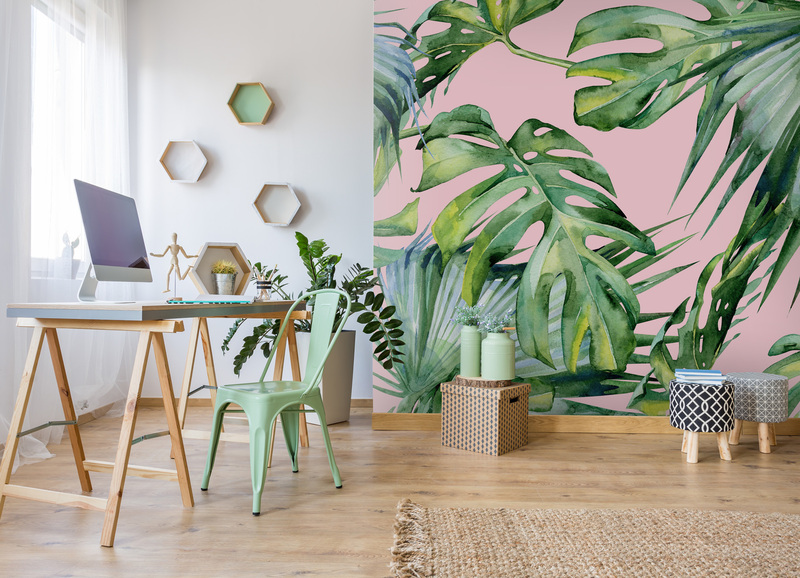 I’m thinking I might go tropical in the bedroom so the two designs above have made it on to the rather long shortlist but I’m really struggling to narrow it down! If pattern isn’t your thing then keep it simple by painting your wall in a single bright colour. 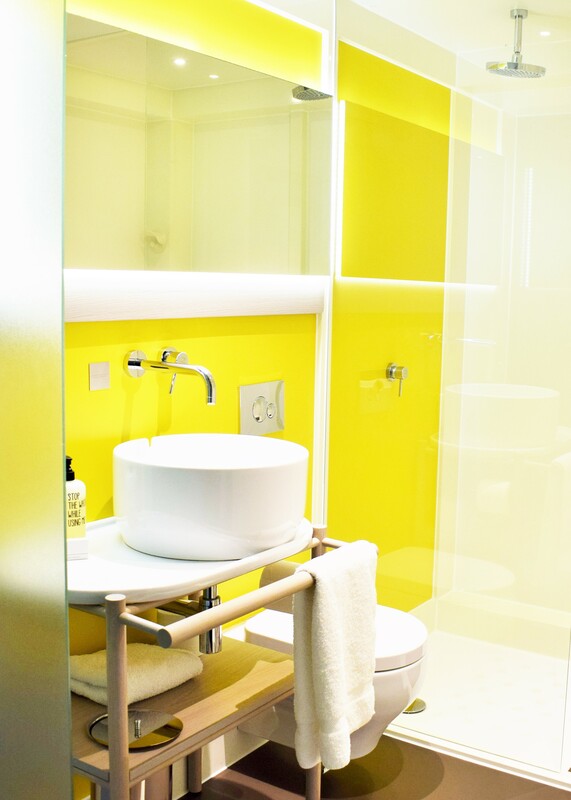 Yellow is always a winner for me so I loved this bathroom in Qbic London! If you decide its not for you or if you want to change the colour scheme you can just paint over it. Nice and easy! 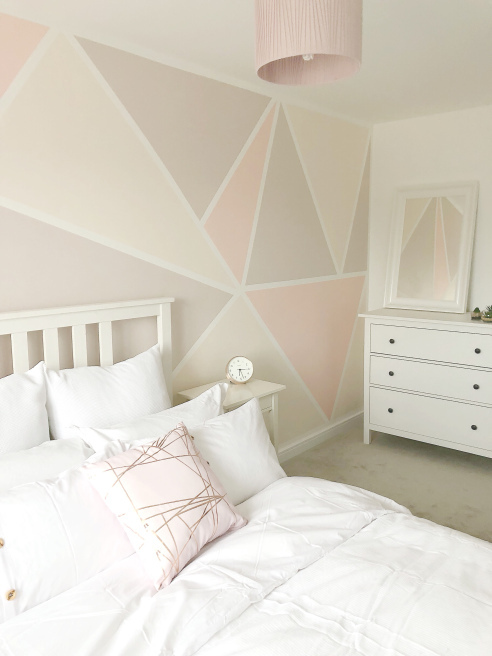 I recently discovered a great blog called Lottie Does, written by fellow colour-lover, runner and homeware addict Lottie, when she posted pics of her beautifully decorated spare room on Twitter. I love the combination of the bold pattern and subtle colours, plus it’s really easy to do which is a bonus! 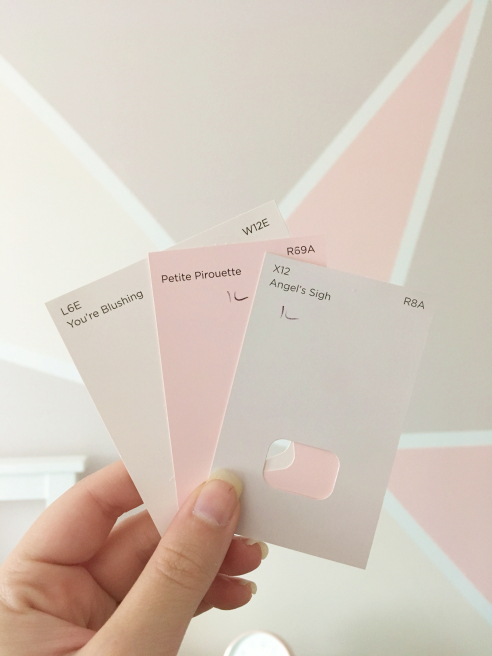 Lottie’s choice of colour palette is so pretty but you could choose any colours you like so the design combinations are endless. You don’t need to stick to paint or wallpaper to create a colourful feature wall. How about taking some inspiration from recent wedding trends and crafting a flower wall? You could hang faux blooms on bright yarn or attach paper flowers to create a 3D collage. Check out my Home Inspiration board on Pinterest for some ideas. 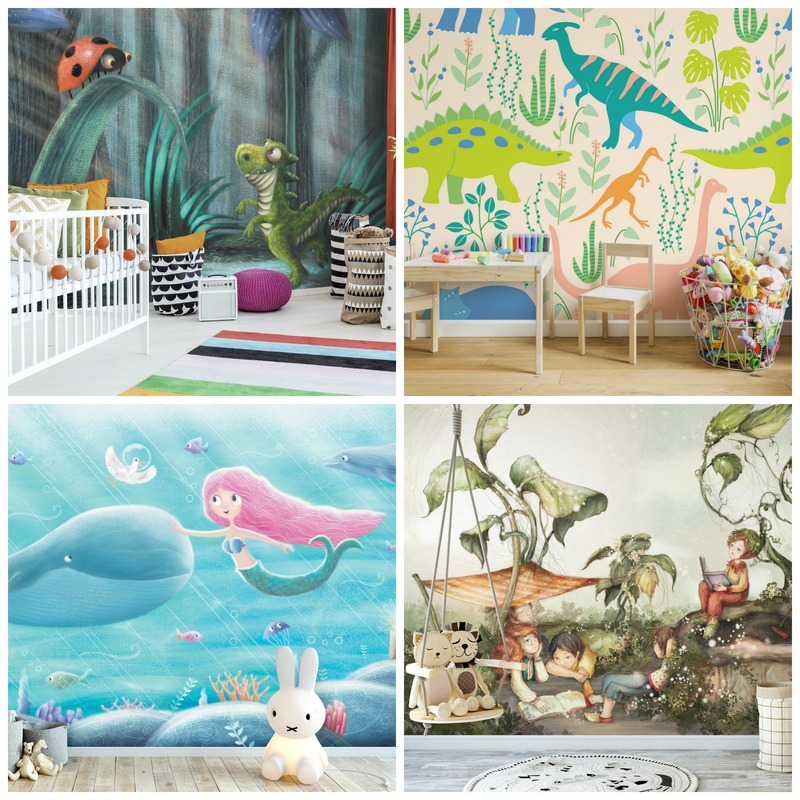 There’s some really great quality wall stickers and decals on the market nowadays (no more plasticky looking inspirational quotes!) so if you’re feeling creative they could be a great option for you. 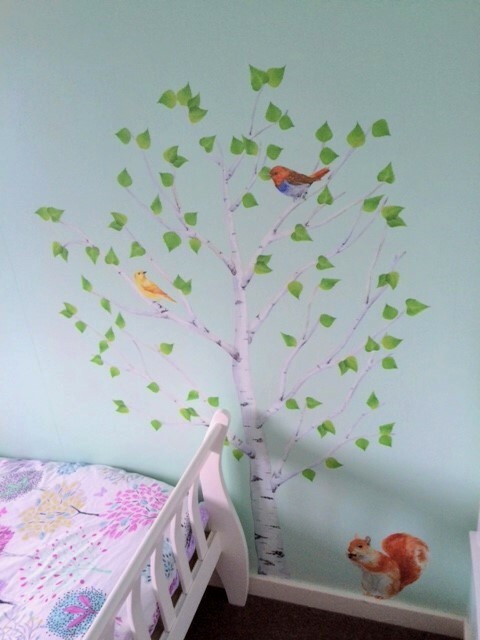 A few years ago we used some beautiful vinyl stickers from Chocovenyl in Madeleine’s enchanted forest themed bedroom which are still going strong and look great. They’re easy to peel off and re-stick so you can change the scene or design as many times as you want and they’re perfect for those of us who rent. Fee from One of Each also recently decorated her daughter’s bedroom in a similar theme with stickers from Stickerscape if you’re looking for more inspiration. Aren’t they amazing?! And after all that I’m still no closer to deciding on a design for our bedroom. But what I do know is that colour and pattern will be involved somehow! 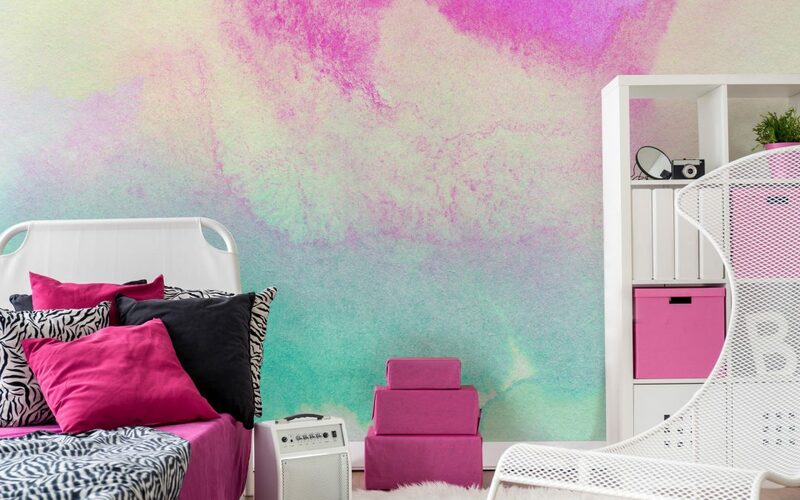 Do you have a colourful feature wall? Come find me on Twitter, I’d love to see!